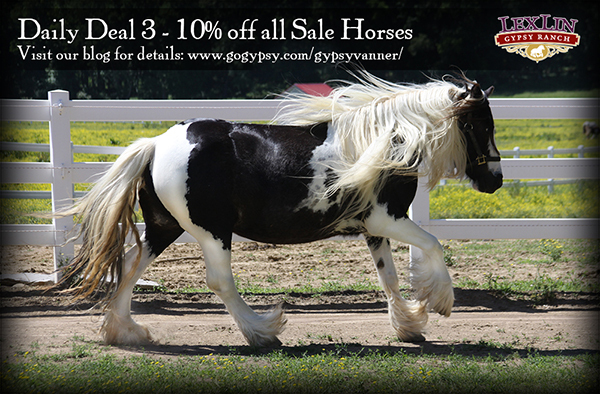 Gypsy Horse Deal of the Day:10% Off All Gypsy Horses for Sale! We’re offering 10 days of incredible deals on Gypsy Horses.Today, day 3, save 10% on any Gypsy Horse for sale that is listed on our website. We will honor this promo from 6pm EST today through 6pm EST on Saturday, July 27, 2013. Featured today is Jenny. Jenny is a sweet 2008 black and white tobiano Gypsy Vanner mare. Her sire is the Son of The Midget and her dam is Daughter of P. Ashe’s Chestnut Horse. Jenny has a kind temperament, tons of hair and great movement. Long term, flexible, customized payment plans are available. Check our blog tomorrow for Day 4 of our 10 Days of Gypsy Daily Deals! Gypsy Horse Deal of the Day: Special Price for Black Gypsy Mare! Gypsy Horse Deal of the Day: 10% of Purchase Donated to our Service Dog Fundraiser! Gypsy Horse Deal of the Day:10% Off All Gypsy Colts for Sale!